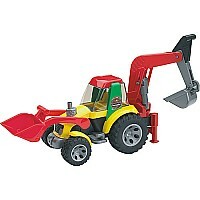 The Backhoe Loader by Bruder has a fully functional Front loader and Backhoe. It also has a drivers cab that opens up and an extending stabilizer to tackle any digging job! Equipped with soft sculpted rubber-like tires. Measures approximately: 13.75 x 7.25 x 7.25 inches..